Afghanistan is in the house as part of MoMA’s tribute to Italy’s art povera superstar in their soon-to-close exhibition Alighiero Boetti: Game Plan. 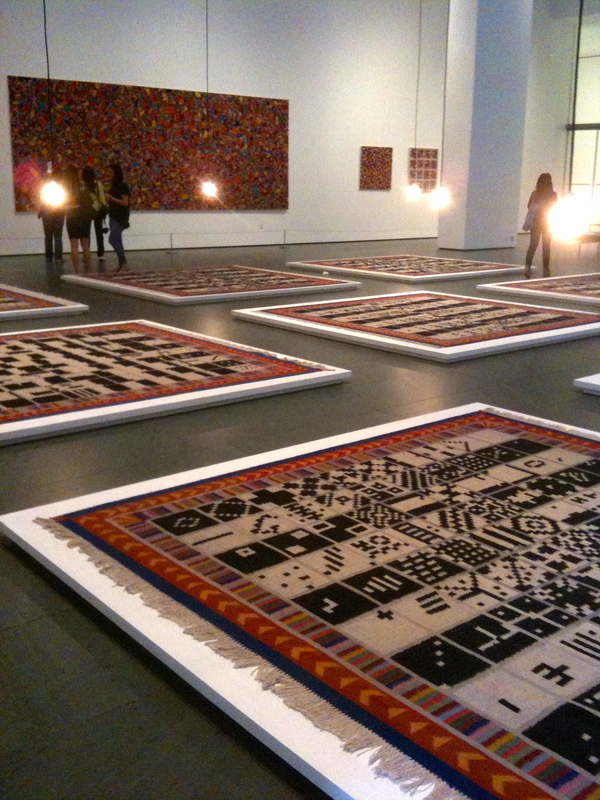 Although Boetti’s retrospective takes up room on MoMA’s other floors, it’s the Afghanistan-made kilims and other art works that really serve as the focal point of the visitor experience. Check out the photos. Get there to see the series of embroideries on tissue and the grid-within-grid rugs with patterns designed by art students and woven by Afghan artisans. Up until the Soviet invasion in 1979, Boetti worked with artists there to carry out intricate woven collaborations – including over 150 maps of the world. 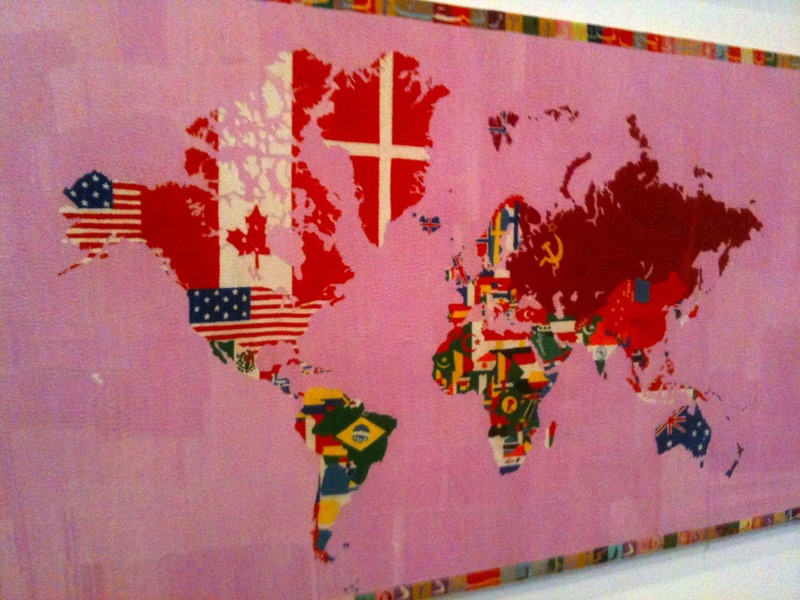 Boetti traced the maps on canvas and let the weavers add whatever text they wanted and pick all the colors. A few are on display here, and you can hear a pretty amazing description about the logistics of Boetti’s collaborations from MoMA curators in a short audio. You’ll enjoy the densely packed embroidery Everything, and the amazing tapestry of the thousand longest rivers in of the world (1976-1982). It took Botetti and his wife years to classify all of the rivers, and if you’ve ever seen this on display before at MoMA (it’s in their collection), it’s an amazing textile that never fails to draw a crowd. You’ve got to see it in person. Check out MoMA’s interactive site for the exhibition, but run over to examine all the Afghani creations up close. Enjoy the trip. This entry was posted in Art, Museums and tagged art, culture, museums, textiles by mssusanb. Bookmark the permalink.